SALT LAKE CITY (AP) — President Donald Trump on Monday took the rare step of scaling back two sprawling national monuments in Utah, declaring that “public lands will once again be for public use” in a move cheered by Republican leaders who lobbied him to undo protections they considered overly broad. Roughly 3,000 demonstrators lined up near the State Capitol to protest Trump’s announcement. Some held signs that said, “Keep your tiny hands off our public lands,” and they chanted, “Lock him up!” A smaller group gathered in support, including some who said they favor potential drilling or mining there that could create jobs. Bears Ears has no oil or gas, Zinke told reporters, though Grand Staircase-Escalante has coal. Trump overrode tribal objections to approve the Dakota Access and Keystone XL oil pipelines. He also used a White House event honoring Navajo Code Talkers to take a political jab at Sen. Elizabeth Warren, a Massachusetts Democrat he has nicknamed “Pocahontas” for her claim to have Native American heritage. “One week ago today, our Code Talkers were disrespected. And one week later, we get this,” said Navajo Nation Vice President Jonathan Nez, referring to the monuments. 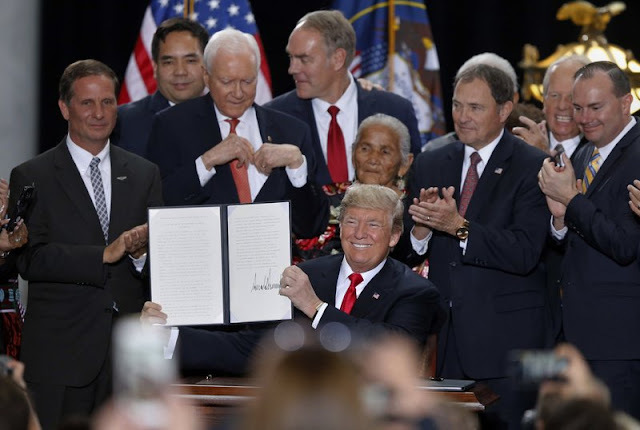 0 Response to "Trump takes rare step to reduce 2 national monuments in Utah"